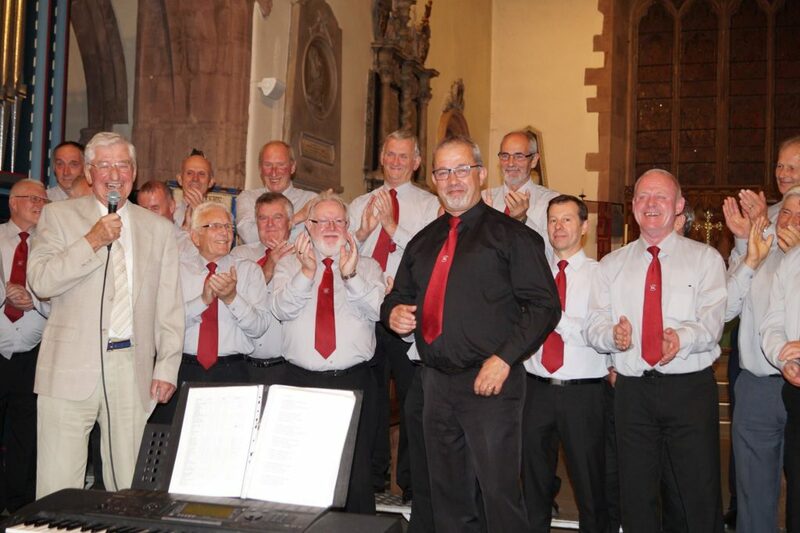 I’m sorry to report the passing of a valued member of the choir namely Wyn Jones – one of the original Choir members. He had been ill for quite a while and bore his illness bravely. He will always be remembered for his rendition of the song Siarabang in our Concerts and his excellent bass voice which would boom out songs from his large repertoire at the drop of a hat. We send our sincerest condolences to Hefina and his family. The Choir have agreed to record their first DVD – this now looks imminent with Hamish from Melin Meredith liaising with Bov to record our repertoire in the Chapel and then produce our DVD – watch this space. 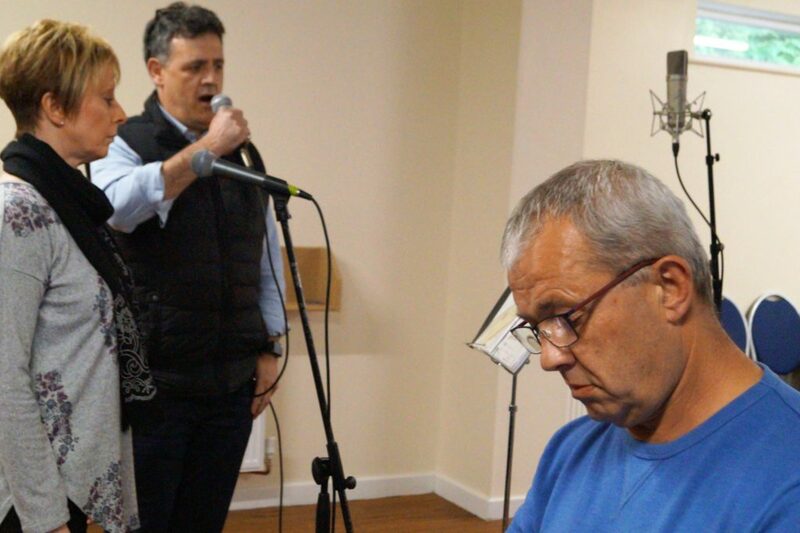 Braf oedd croesawu criw recordio BBC Radio Cymru i un o ymarferion y Côr – Rhys Meirion yn sgwrsio hefo Bov ac aelodau o’r cor ac yn ymuno hefo Eirlys ar cor mewn can! Edrychwn ymlaen at wrando ar y rhaglen “Dewch am Dro” 12.30 y pnawn, Mai 18. 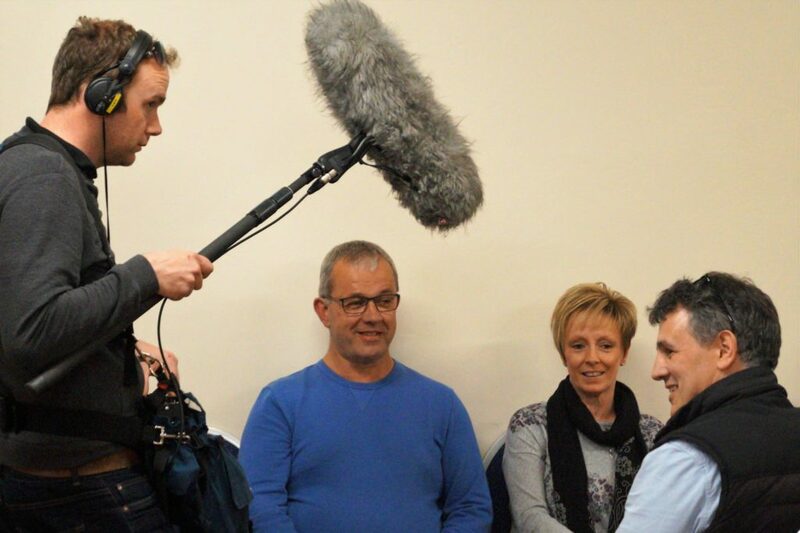 The choir were glad to welcome a recording crew from BBC Radio Cymru to a choir paractice – Rhys Meirion interviewed Bov and choir members and joined Eirlys and the choir in song! Everyone who heard the programme enjoyed it – try and do a catch-up to hear it – the programme is called “Dewch am Dro” at 12.30p.m. on May 18. The Rhewl football fraternity were upset with Rhys Meirion when he called our building the Rhewl Cricket Pavilion and not the Rhewl Pavilion. The choir is looking forward to the musical arrangement of this lovely song that Bov and Elizabeth will create. Gwilym and Brian seem to have settled nicely in the Choir; sadly Gwyn Howatson has retired. Quite a few members have suffered various ailments recently but should be back with choir shortly. 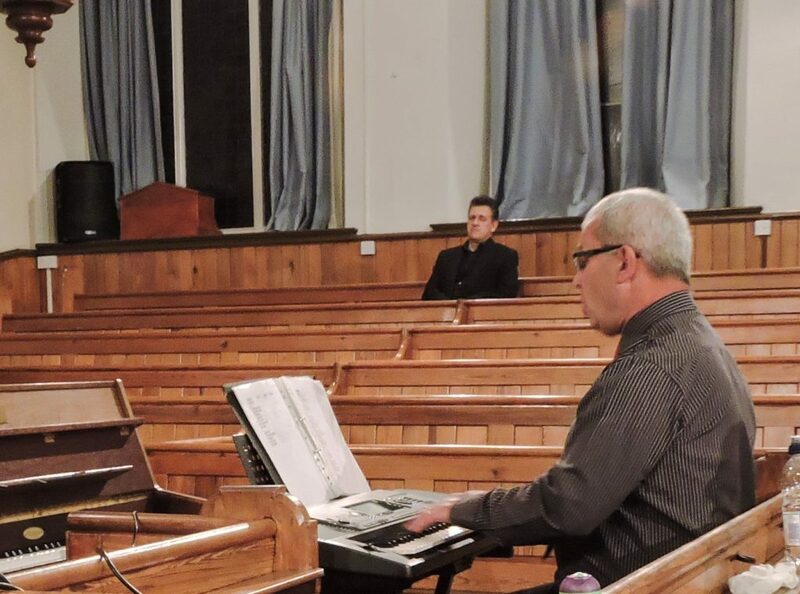 The Choir unanimously agreed to donate a substantial amount to the Rhewl Pavilion ‘Chair’ Fund – one of the reasons for starting the choir was to help with Pavilion and Playing Field and since then members of the Choir have supported this cause as well as using the Pavilion for Practices. 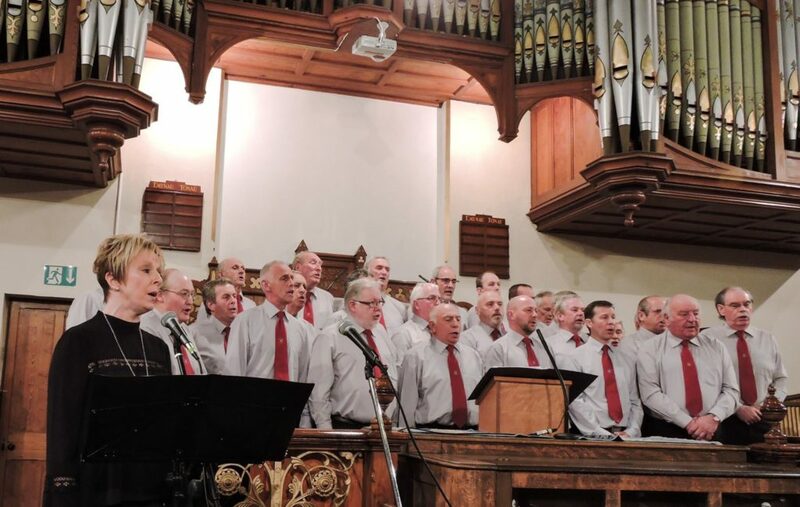 Remember to look in at the “Cor y Porthmyn” Facebook site for information about the choir and loads of photos. 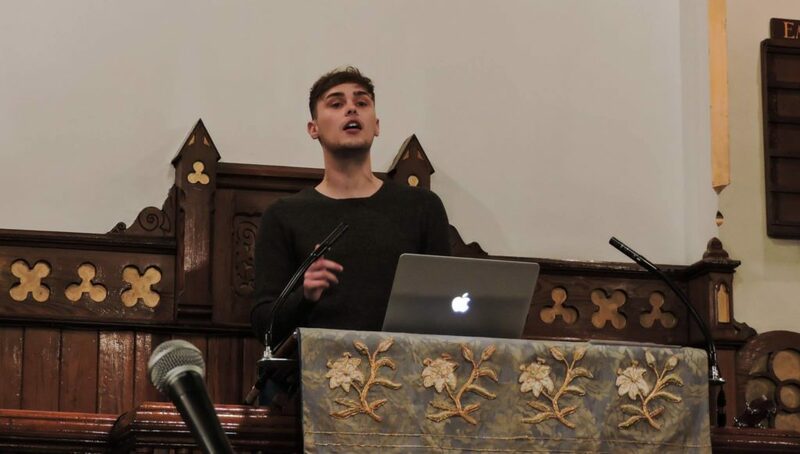 Mae y Côr yn brysur yn dysgu cân newydd sef Y Bugail da – cerddoriaeth gan Bov a’r geiriau bendigedid wedi cael eu ysgrifenni gan Gwilym R Jones Dinbych. We are also practising the “Jar of Hearts” song which we all think will become popular with our audiences. Below is a list of concerts for the final part of 2017. 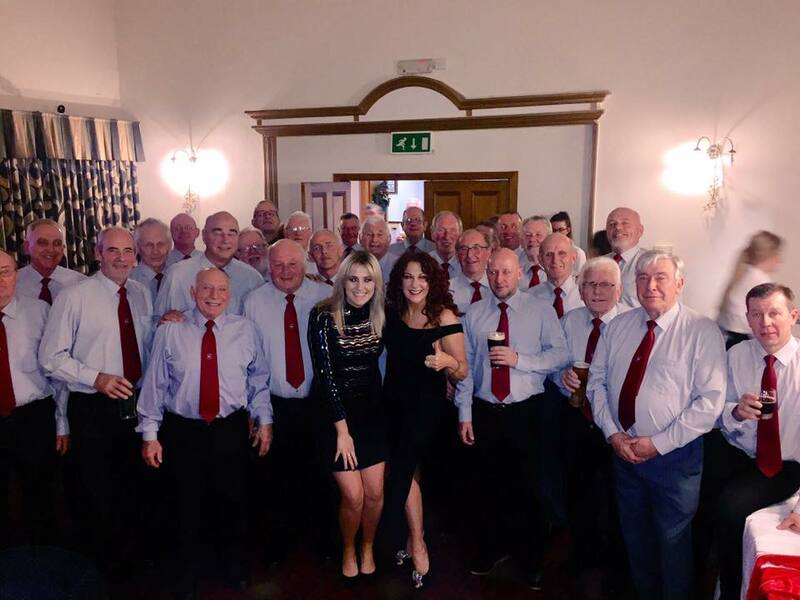 Saturday November 11th – Private Birthday Party – Rhewl Pavilion The Choir was delighted to take part in the 90th Birthday celebrations of Hilda Lewis. Hilda and her late husband Jack Nelson were stalwarts of many organisations in the Rhewl and Ruthin area such as Rhewl Football Club and the Clwydian Morris Dancers. The Choir were pleased to be asked to take part in this NSPCC concert in the beautiful Northop Parish Church. 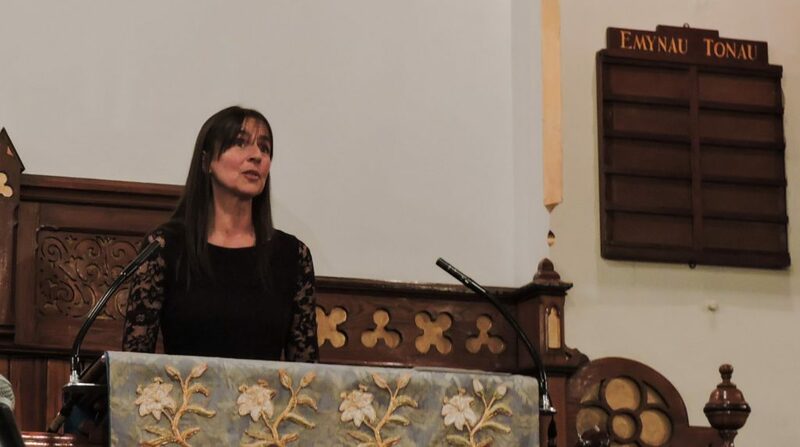 The Church was full and the audience enjoyed the Choir as well as their fellow guests namely the Northop Silver Prize Band, Molly Evans, Lleucu Hâf Davies and a witty compere – local headmaster Mr Nigel Parry. The performance of the Band was stunning and they are celebrating their 125th anniversary this year. Currently they are the only Championship Section band in North Wales and they proudly won first place at this summer’s Sir Fôn’s National Eisteddfod. The Band also did a “World Premier” of a piece called ‘Bontuchel’ written by band member Ioan Rees who comes from our neighbouring village up the River Clywedog. 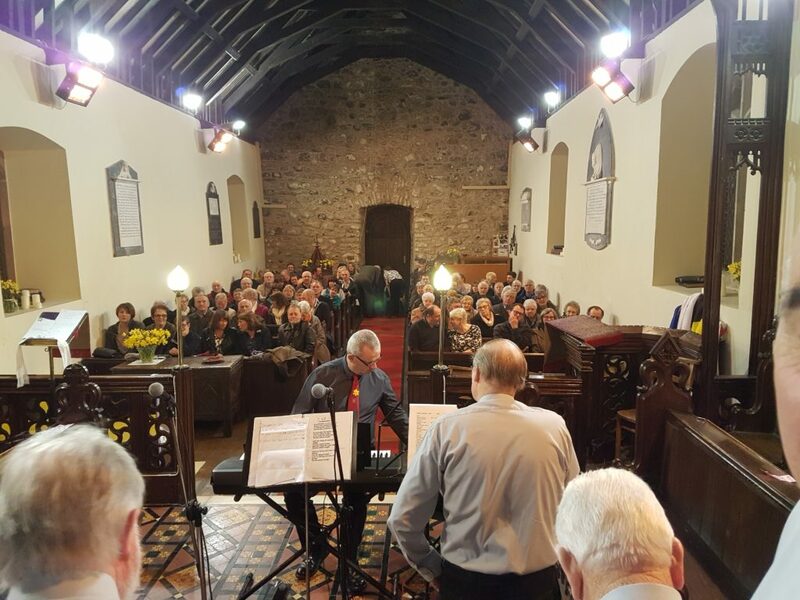 The more elderly members of the Choir thoroughly enjoyed the Band’s rendition of the Beatles number “Ticket to Ride” which they based on a steam train ride. The final word of thanks and presentations were carried out by Beth Hughes who now lives in Glan Clywedog, Rhewl,with husband John Eryl, but used to live in Sychdyn and who has been actively involved with this group for many years. Also thanks to the ladies of the Group for the lovely supper enjoyed in the Bandroom. 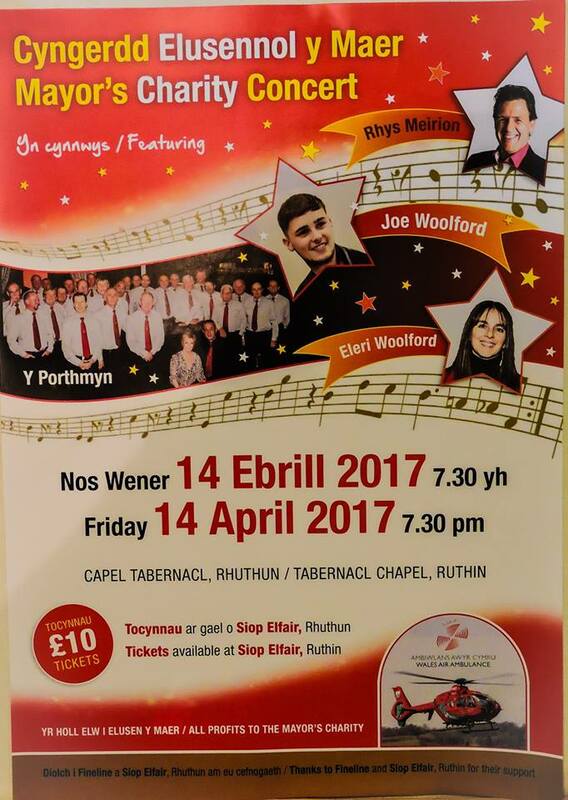 Cafwyd noson lwyddianus yn Eglwys Sant Caffo yn eu Cymanfa Ganu blynyddol. Canodd y Côr bedair emyn ac ymuno gyda’r gynulleidfa i ganu deuddeg emyn arall. Roedd hon yn noson draddodiadol gyda llawer o gantorion lleol gwych yn ymuno yn y wledd o ganu emynau Cymraeg. Profiad hollol newydd i rai o’n hogiau ni. Rhanwyd y llwyfan gyda Steffan Lloyd Owen – Bariton ifanc addawol o Gaerwen. 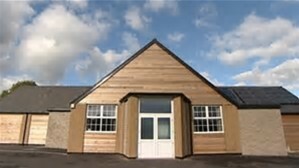 Rydym yn ddiolchgar iawn i merched yr Eglwys am y swper swmpus a mwynhawyd cyn droi am adre, yn hwyr nos Sul. The choir was delighted to accept an invitation to hold a concert at St Peter’s Church to help raise funds for the restoration of Church’s Roof. The audience was substantial and very appreciative which they displayed by giving the choir a standing ovation at the end of the evening. About a third of the choir were not able to attend – for a variety of reasons which made Bov and his choir’s performance even more remarkable. 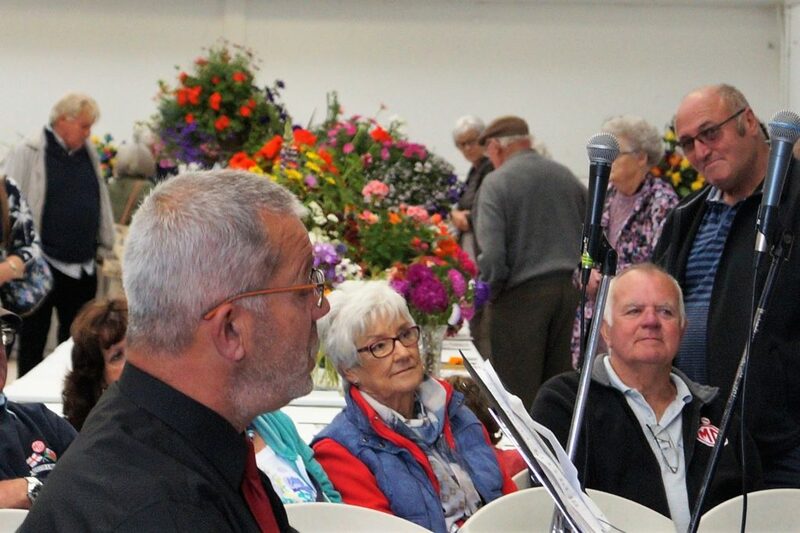 This was our fourth invitation to sing at the Flower show and the most enjoyable. 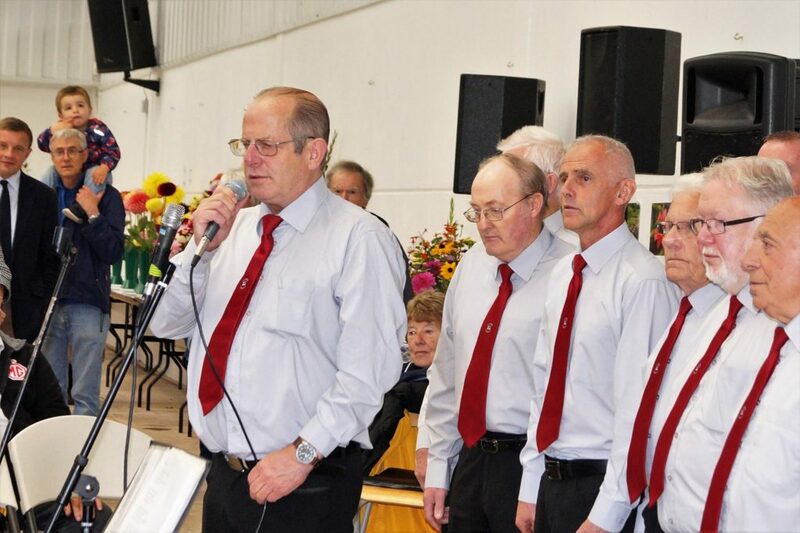 We sang in the Big Hall of the Farmers Auction with excellent audiences for both our sessions. It was a great disappointment for the Organisers, Artistes and Spectators that the weather was so awful, however the show carried on – we just hope that GraigAid made some money for their Charities. This was the third occasion that the choir had been invited to take part in a concert at this beautiful church and it was a lovely occasion with the choir and the soloists on form and the audience very appreciative of our efforts. 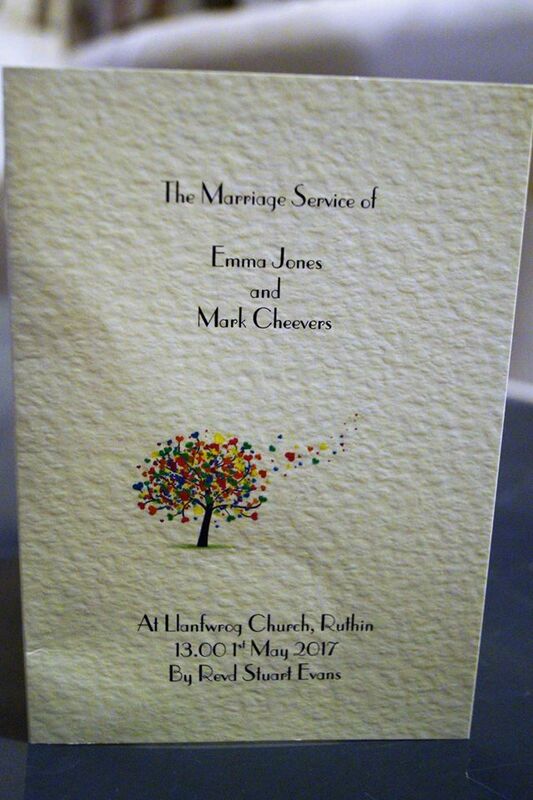 The Choir was delighted to sing at Emma and Mark’s wedding at the beautiful Llanfwrog church. 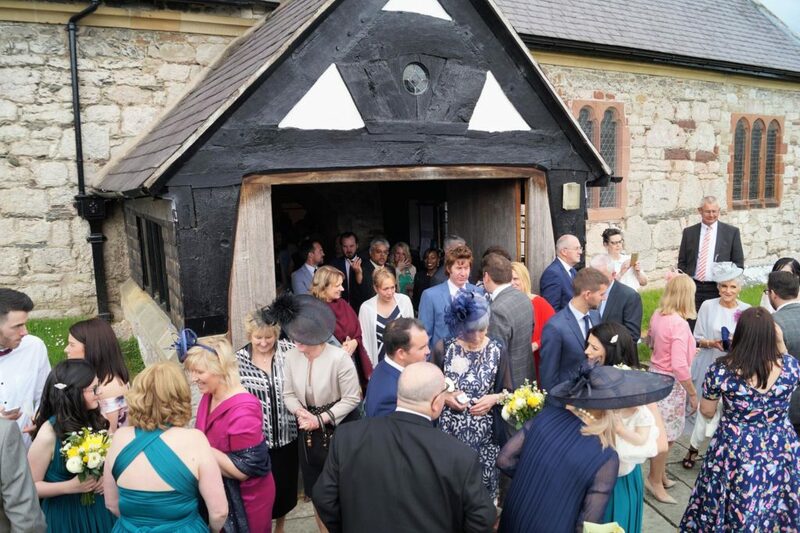 The Choir sang a very suitable love song, Oh I would walk a thousand miles just to be with you, as the bride entered the church – the video of this rendition has received a large number of plays on the Y Porthmyn facebook page. The choir were very grateful for the generous donation to our charity coffers. 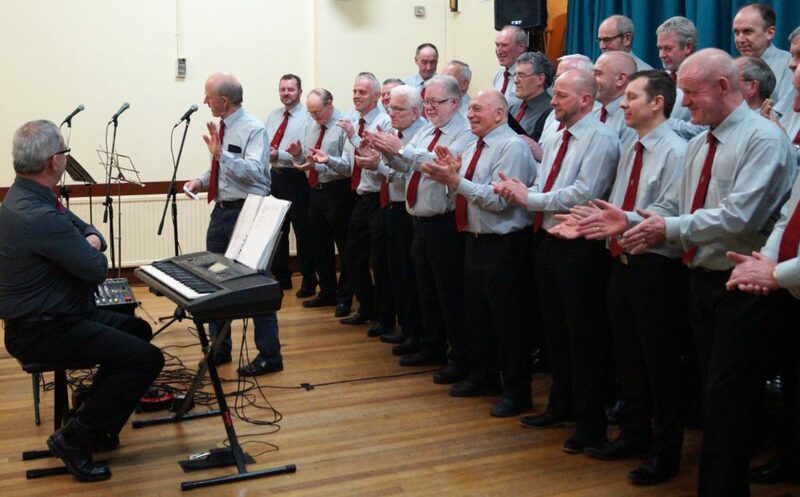 The choir took part in a memorial evening for the life of the late Dennis Hession who was a likeable character who worked for Jones Brothers all his working life. Many of his ex-colleagues attended together with members of his family. The proceeds of the evening went to the local branch of First Responders Wales and also for the purchase of defibrillators. 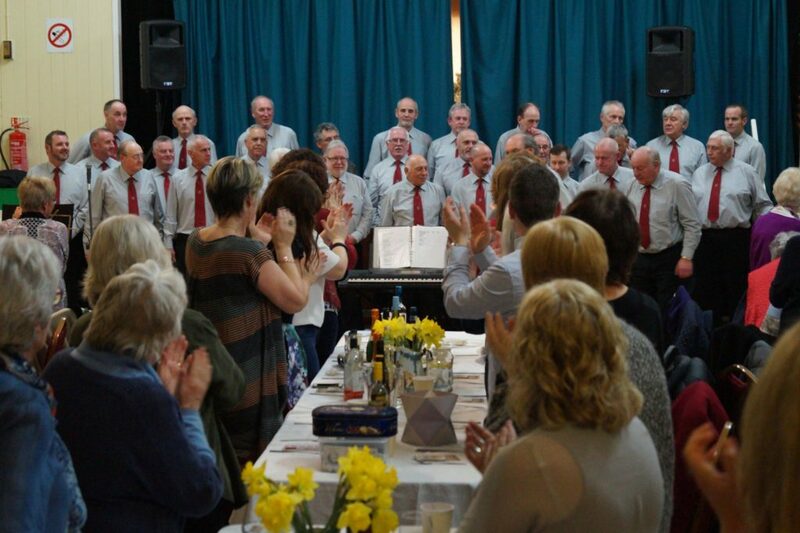 The choir provided the entertainment at Trefnant WI’s St. David’s Day celebration at the Village Hall. A sizeable audience had gathered, which included the odd husband, and they enjoyed a lovely evening. A mention must be made of the supper which was of a typical WI high quality. Most of the choir had not been to the Hall before and were very impressed with its spaciousness and acoustics. Choir member Marc and wife Eirian, Wern Neidr, organised this concert to raise funds for maintaining their church and it was our third visit to this lovely building. As you see from the above photo the Church was ‘nicely’ full and there was a lovely atmosphere. The choir sang our new song ” Y Bugail Dda” for the first time in concert and Bov was reasonably(?) happy with our rendition. Supper was served in the Red Lion and the evening finished with Bov getting his guitar out to accompany the songsters until the early hours. An interesting statistic was mentioned – that this was the Choir’s hundredth concert – Crikey!!!!! 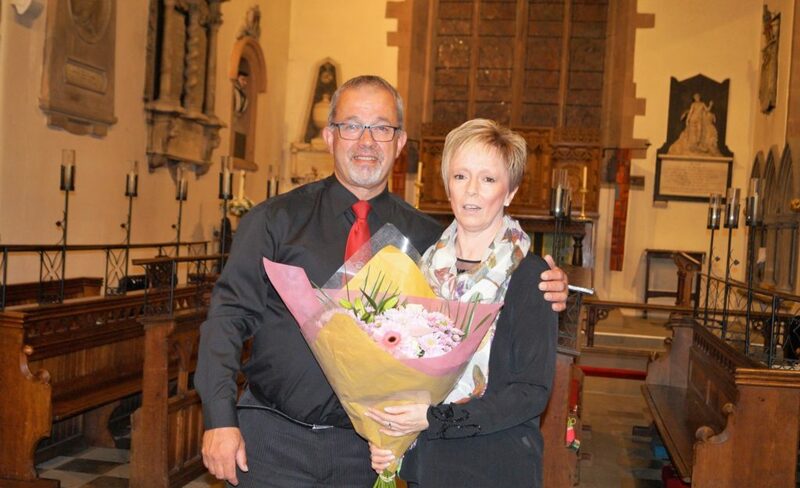 When Choir member Dewi Jones asked his fellow members if they were willing to take part in a musical evening to raise funds for the Motor Neurone charity organised by his daughter Non for her friends – the choir were more than willing to participate. Dewi lost his wife Betty, and Non her mother, to this cruel disease. The choir has a new member singing for the first time with the choir in concert – the dark blue shirt is a giveaway – croeso i Gwilym Meirion. The evening was very successful with over a £1000 being raised for the Charity. 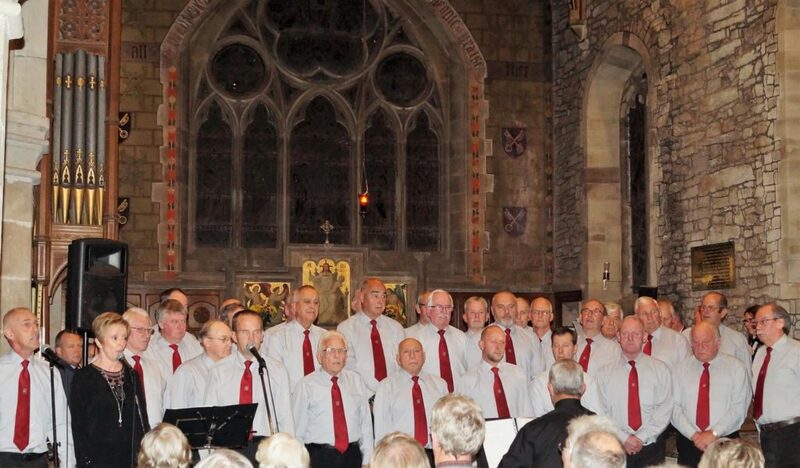 The choir sang first and then went on to the The Fox and Hounds pub in the village Pwllglas to enjoy their supper. The audience remained in the hall to participate in some Country Dancing organised by Non.